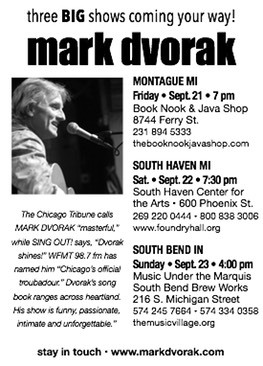 SOUTH HAVEN MI - Foundry Hall welcomes Chicago’s "official troubadour" Mark Dvorak to the South Haven Center for the Arts for an intimate acoustic performance on Saturday, September 22 at 7:30 pm. The South Haven Center for the Arts is located at 600 Phoenix Street. Tickets are available at 800 838 3006. 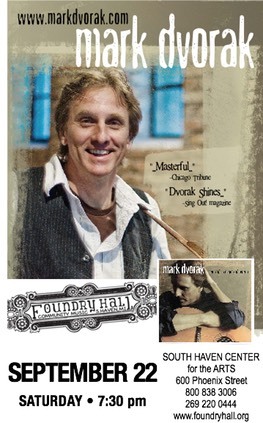 For more information contact Foundry Hall at 269 220 0444 or on the web at www.foundryhall.org.